Andy Brack of Statehouse Report was working on a piece for today about the primaries and sent me some questions. Well, y’all know how I hate to write anything, however impromptu and off-the-cuff, without publishing it. 1. What did you learn and what are your takeaways from the primaries? While it can be political death in a South Carolina Republican primary to openly oppose Donald Trump, telling everybody he’s your best buddy isn’t a sure road to success. Ask Mark Sanford about the first, and Henry McMaster about the second. McMaster is in a remarkably weak position for an incumbent. 2. What do the results in the 4th district tell you about the November election? Can’t say. I didn’t follow it. It seems beyond belief that anyone would vote for Lee Bright for anything, but apparently it happens. It looks like we all might be missing Trey Gowdy this time next year. 3. Do you expect the governor’s race will be between McMaster and Smith, as I do? What hurdles does Smith have to winning? What would keep McMaster from winning? I don’t know if Henry’s going to make it or not. Everybody seems to be ganging up on him at this point. 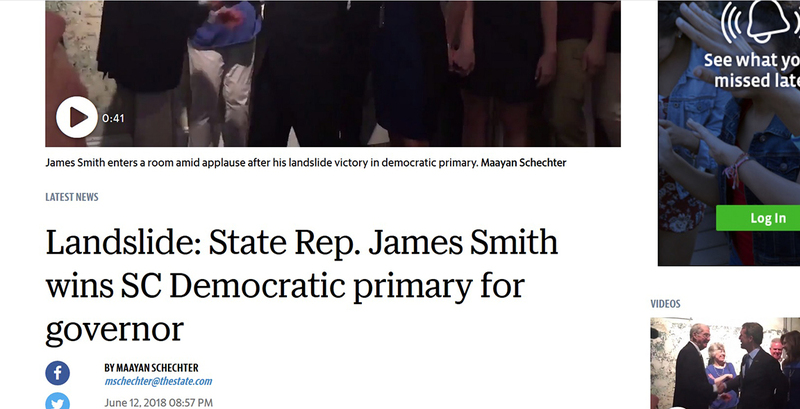 Smith’s one hurdle is being a Democrat in a state where many white voters seem congenitally incapable of voting for someone with a “D” after his name. McMaster’s problems are his association with the Quinns, his Old School image, the fact that he wasn’t elected to the position, and the possibility that at some point his slavish devotion to Trump — at times, the relationship seems to be all he can say about himself — could become an albatross for him. 4. Can you measure the impact of Trump on SC politics in general right now? I sort of answered that on Question 1. But while we know the impact in a GOP primary, it remains to be seen what the effect will be in the general election. 5. Anything else stand out? This entry was posted in 2018 Governor, Blogosphere, Democrats, Elections, Henry McMaster, James Smith, Mandy Powers Norrell, Republicans, South Carolina on June 15, 2018 by Brad Warthen. 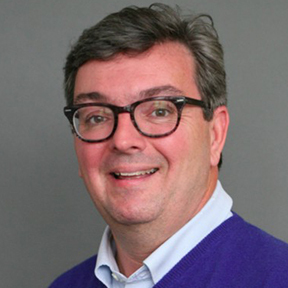 Greenville businessman John Warren received a major boost Tuesday in his quest to unseat Gov. Henry McMaster in the Republican primary runoff for governor, landing the endorsements of Lt. Gov. Kevin Bryant of Anderson and Mount Pleasant labor attorney Catherine Templeton . McMaster got only 42 percent of Tuesday’s GOP primary vote, forcing a runoff. Warren, Templeton and Bryant received a combined 56 percent. Warren finished second, and is hoping his former rivals’ backing could push him over the top. This particularly has to be painful to an old-school Republican like Henry, a believer in Reagan’s 11th commandment. Remember how dutifully Henry lined up behind Nikki Haley after the upstart took the nomination from him in 2010? (COLUMBIA, S.C.) Over a three year period, John Warren avoided paying more than $120,000 in taxes. Warren refuses to explain how he did it. 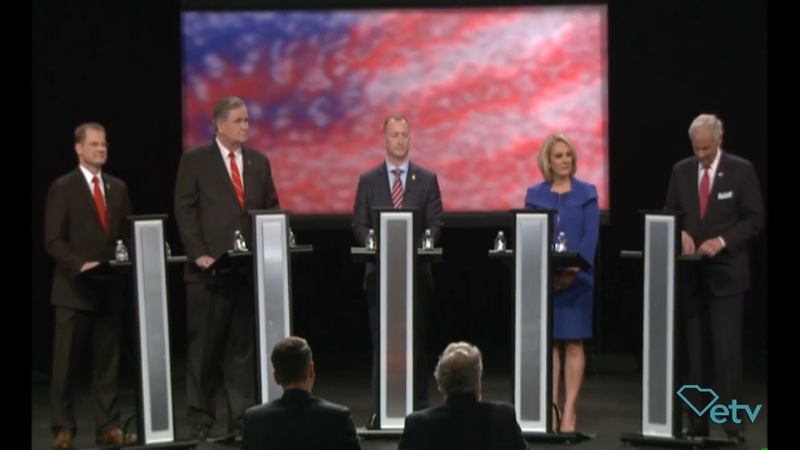 Therefore, conservative buzzsaw and Republican gubernatorial candidate Catherine Templeton is today calling on John Warren to immediately disclose to voters the specifics of his tax avoidance scheme. Warren said he donated two pieces of property in Horry County and outside of Charlotte. A search of property records yielded no results under Warren’s name, adding mounting evidence to the idea Warren established a complicated tax avoidance syndicate. According to news media reports, tax returns indicate Warren and his wife claimed more than $715,000 in non-cash charitable donations on their federal tax returns from 2014 to 2016. While those returns included no details, The Charleston Post & Courier reported Warren received $122,500 in tax refunds as a result of the donations. The newspaper also reported that details about the land were redacted. May also noted that Warren has accepted the maximum $3,500 campaign donation from Frank Schuler, president of Ornstein-Schuler, which facilitates these complicated tax avoidance schemes. Additionally, Schuler is president of Partnership for Conservation organization and treasurer of the Partnership for Conservation PAC. The PAC has a history of donating to liberal senators and the Democratic Senatorial Campaign Committee. “While Warren claims to make ethical decisions, his land donations and close ties with Schuler could suggest otherwise. John Warren needs to explain these dealings to the people of South Carolina,” May said. This entry was posted in 2018 Governor, Henry McMaster, Republicans, South Carolina on June 14, 2018 by Brad Warthen. I dropped by Smith HQ this afternoon and the front room was empty — everybody was out working. And they did a great job! James Smith wins it all in a landslide! 62 percent with 75 percent reporting! No runoff or other folderol! 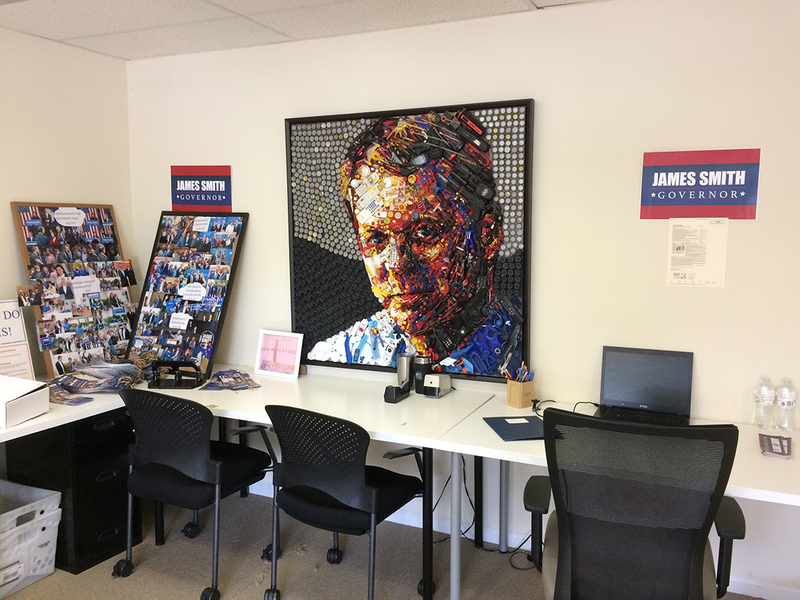 It turns out that Democratic voters (and smart people who crossed over to vote for James) in South Carolina aren’t nuts after all, despite those anxiety-causing polls. On to November! Catherine Templeton is out of it! So I guess Republicans aren’t nuts, either. Perhaps they’re beginning to recover from their malady of 2016. A weakened McMaster came out on top, but faces a runoff against an unremarkable unknown most of us still don’t know (which is way better than being in a runoff with the “buzzsaw”). Which just couldn’t bode better for James in the fall — and a guy with a D after his name needs EVERY break he can get! Which is great news for South Carolina. Micah Caskey seems to be cruising to a big win, so I need not feel guilty for not having personally helped him by voting in his primary. Way to go, Micah (it was that sign in my yard that did it)! 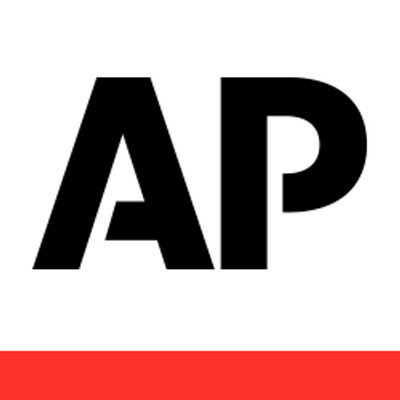 This entry was posted in 2018 Governor, Catherine Templeton, Democrats, Elections, Henry McMaster, James Smith, Republicans, South Carolina on June 12, 2018 by Brad Warthen. 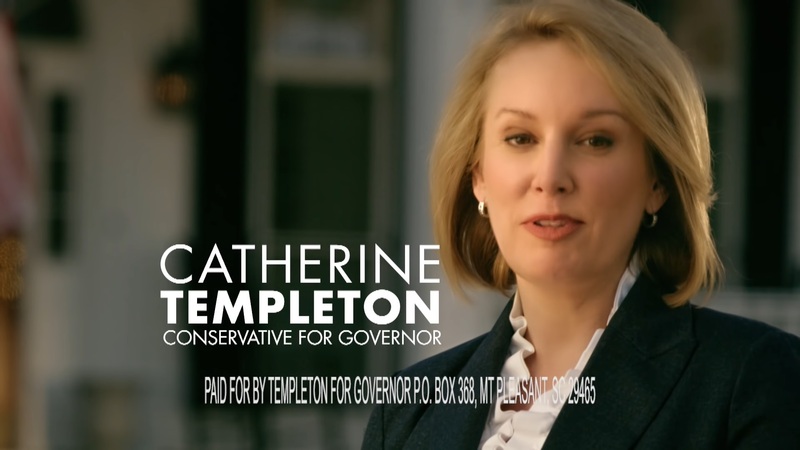 (COLUMBIA, S.C.) Conservative buzzsaw and Republican candidate for governor Catherine Templeton secured a long list of major endorsements Tuesday. 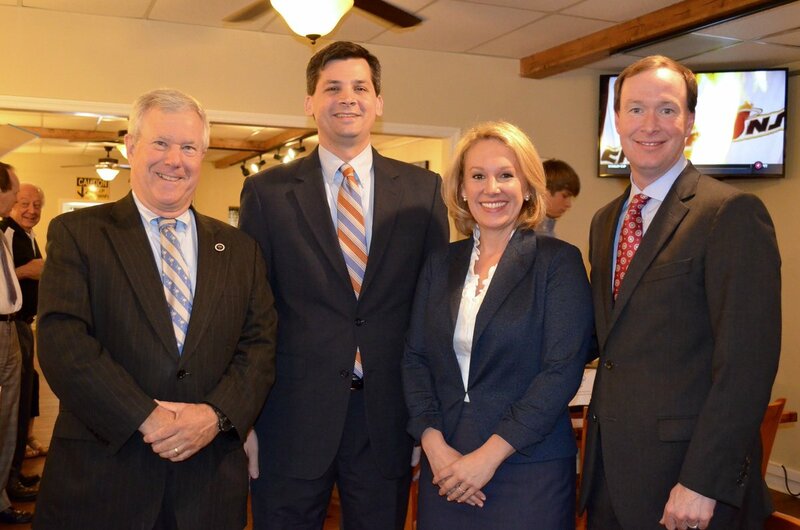 State Senate Majority Leader Shane Massey (R-Aiken), Representative Bill Hixon (R-Aiken), and Representative Micah Caskey (R-Lexington) all threw their support behind the buzzsaw at two separate press conferences in Aiken and Lexington…. I was talking with a mutual acquaintance over the weekend who speculated that Micah had early on wanted to support Ms. Templeton, but just hadn’t been able to do so on account of, you know, the campaign she has run. I almost yelled, “Shut your mouth!” But then I realized that Micah is a freshman who has boldly confronted his party’s governor, so of course he would want an alternative to Henry. He’s made a semi-powerful enemy. And then, WHAM! Right between the eyes. Whatever… Do y’all remember when Micah first ran two years ago? How I had been thinking of running myself (on the UnParty ticket), but decided not to when I met him because I was so impressed with him? I’ve told that story a number of times, and each time I recall that there was only one topic that came up during our conversation that we disagreed on (which is phenomenal; I could count on the fingers of one hand the number of people I know in politics I can say that about) — and I couldn’t remember for sure later what that one thing was. Well, I don’t have to. From now on, I can say this is the thing we disagree on. And it’s a biggie. Caskey wadding up the governor’s veto message and throwing it away last year. This entry was posted in 2018 Governor, Catherine Templeton, Endorsements, Micah Caskey, Republicans, South Carolina on June 5, 2018 by Brad Warthen. The empty space in the State House underground lot. I shot this in early April . It’s been vacant a LONG time. Sen. John Courson has entered a guilty plea and resigned his seat in the Senate. This is a sad day, as I — like most people who have interacted with him over the years — have always liked and respected him, so this is very disappointing. If you want comments from someone who is pleased by this situation and will talk with satisfaction about how the senator “got what he deserved,” I refer you to our own Doug Ross. First, whither the Pascoe investigation? John Monk reports that Courson has “agreed to cooperate with an ongoing investigation into public corruption in the S.C. State House.” Is there an ongoing investigation? Because it doesn’t seem to have “ongone” anywhere in the last few months, ever since charges were dropped against Richard Quinn, Rick Quinn was allowed to plead to a misdemeanor, and the special prosecutor David Pascoe criticized the judge for not sentencing Quinn fils to prison, even though he, Pascoe, had allowed him to plead to a charge that did not warrant prison. Since then, the probe has seemed to be in limbo. Is it coming back to life now? 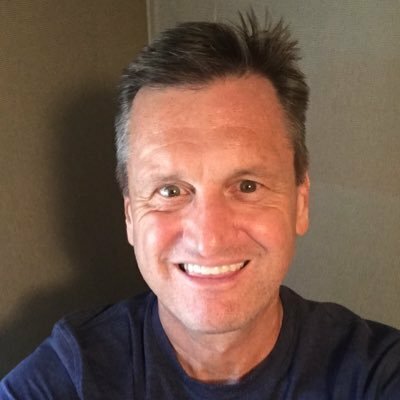 Will this cause the attack on James Smith that did not happen two weeks ago to happen now? I’m still puzzled that the rumored attack did not materialize when expected. Did the attackers have an attack of conscience (I’m trying to consider ALL possibilities, you see)? Will this tempt them to do their dastardly, unfair worst? Given some things I’ve seen happening in the Democratic contest lately (more on that later), very little would shock me. What, if anything, happens in the GOP race for attorney general? Several months ago, it looked like this was going to be a knock-down-drag-out, with the Pascoe probe as the topic dominating everything else. Pascoe was telegraphing like crazy that the public official he most wanted to go after next was incumbent Alan Wilson. Todd Atwater decided to give up his House seat (now being sought by Paula Rawl Calhoon, whose ad you see at right) to challenge Wilson against that background. But with the Pascoe investigation in suspended animation recently, Wilson has been able to run a pretty conventional incumbent re-election campaign, stressing positives in his record rather than going on the defensive. Does today’s development change that dynamic? What exactly did Courson plead guilty to doing? According to John, he had been charged with “misconduct in office, criminal conspiracy and converting campaign money to his personal use by taking kickbacks.” But the report says he has owned up to one count of “misconduct in office.” Since the converting campaign money to his personal use part was a separate charge, does that mean that is dropped? So what has he pled guilty to? If the investigation is “ongoing,” who might be targeted that we don’t even know about? No one who knew Courson would have expected his name to come up (of course Doug knew, something that I type just to save Doug the trouble), so anybody could be a target. 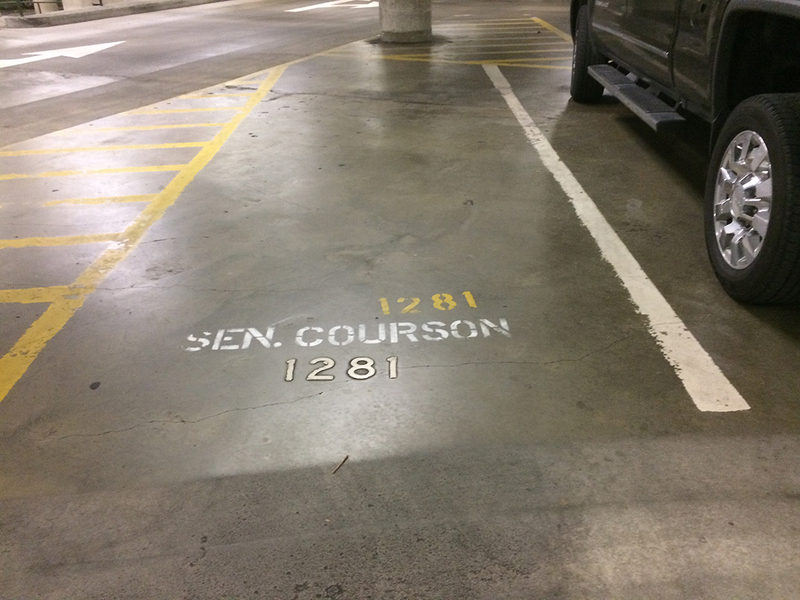 Who will be running for Courson’s seat? I know of one person who’s highly likely to run, whom I won’t name until I get confirmation. But beyond the who, exactly how does this unfold? I assume there will be a special election, but does it occur before the election we’re having anyway this year? That Senate district has already gone a full session without representation, so what would be the hurry now, with the General Assembly practically done for the year? Those are my first thoughts. Others will no doubt occur to me. This entry was posted in 2018 Governor, Crime and Punishment, Elections, Legislature, Republicans, South Carolina on June 4, 2018 by Brad Warthen. This is one of the most unfair, unwarranted attacks on a political candidate I’ve ever seen, and I’ve seen a lot of trash in my day. And in terms of showing contempt for the intelligence of voters, I’m sure it’s the worst. I’m insulted that it came to my home, because it is aimed at idiots. And in keeping with the times, at a particular variety of idiot — the kind that will believe a painfully obvious liar when he accuses someone else of “lyin’.” There are obviously some of those about, but most people know I’m not one of them. That Micah Caskey didn’t somehow pass this long-overdue measure alone. When he voted for the gas tax increase — our state’s first in three decades, which came as part of legislation that also reformed the unaccountable Department of Transportation — he was doing so as part of an overwhelming Republican, conservative majority. He was supporting something that only unprincipled political cowards, such as our feckless governor, opposed. That the gas tax increase is to be phased in over six years, and the first one-sixth of it was implemented less than a year ago. That even if the entire amount had magically been raised at once, it’s far too early for anyone to expect the work it was meant to pay for to have been completed. That NO ONE has ever said anything to suggest that Lexington County roads would be first in line to be fixed, and even if they had been, again, this would be awfully early to expect the work to be done. 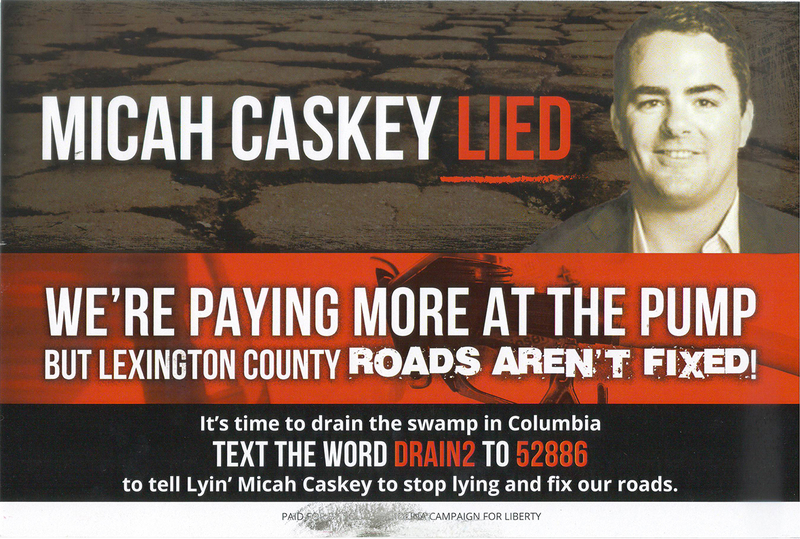 That Micah Caskey has never said, to my knowledge, a false word about roads or taxes or anything else that’s come up since he’s been in office. 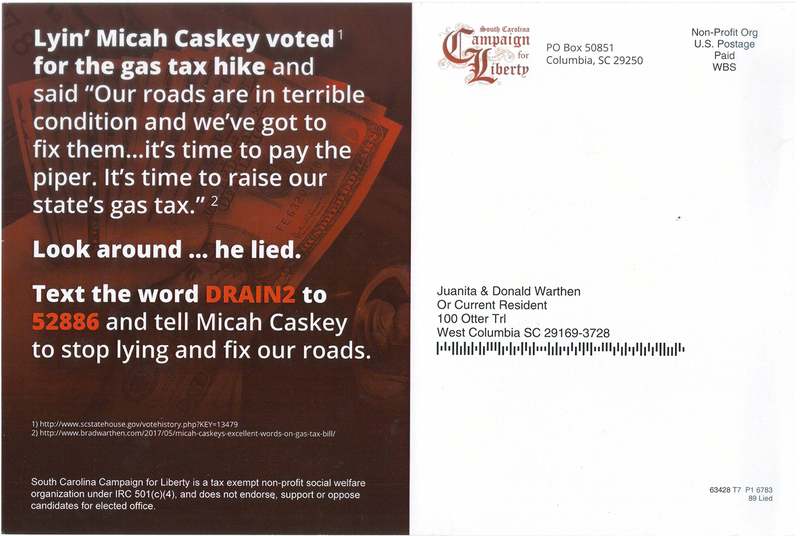 More specifically, that he has not only never said, he has never even hinted, anything that anyone, even the biggest idiot in the world (this mailer’s intended audience), could possibly interpret as suggesting that within 11 months of the first sliver of the tax increase being implemented, the road problems of his district would be solved. Yeah, that last sentence was kind of involved. It got away from me a little and got kinda repetitive. Chalk it up to the fact that I am really ticked off to see this. It’s not just that no candidate, even a bad one, deserves to have this kind of scurrilous crud flung at him. It’s not just that Micah Caskey is about as far as you can get from being a bad candidate. In fact, he may be the best representative I’ve ever had. He’s one of only two political candidates whose signs I have put up in my yard ever. 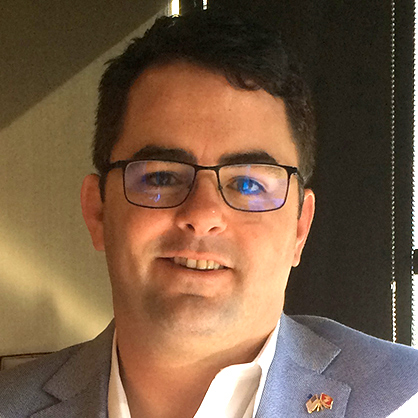 This entry was posted in Character, Elections, Micah Caskey, Republicans on May 26, 2018 by Brad Warthen. It’s time for a governor as bold and conservative as the people of South Carolina. Um… you can’t be both of those things at the same time. You can be bold if you choose. Or you can be conservative instead. You have to choose. Otherwise, words have no meaning. And who wants to live in a world like that? 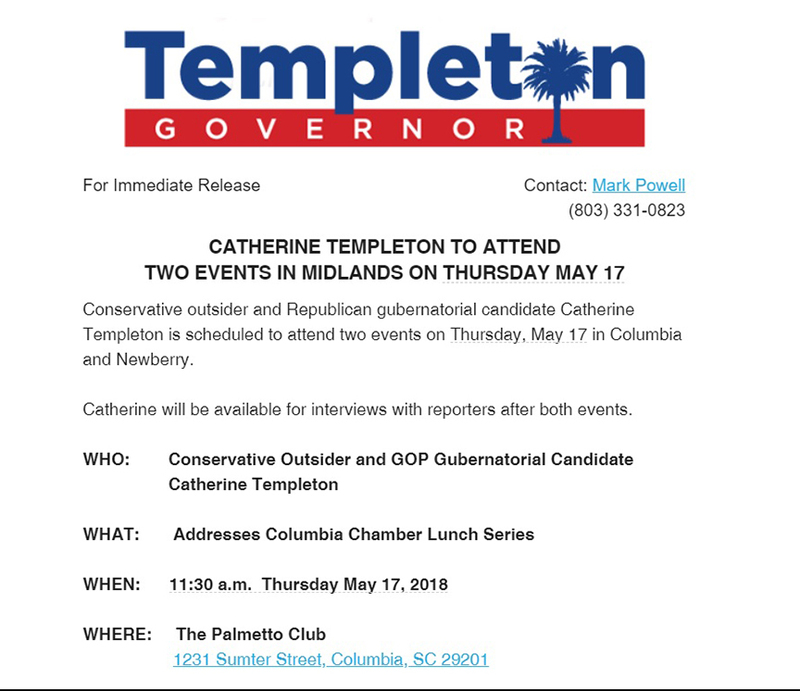 This entry was posted in 2018 Governor, Catherine Templeton, Character, Republicans, South Carolina, Words on May 23, 2018 by Brad Warthen. Yeah, I know I’ve written about this before, more than once. But they keep doing it, so I’m going to keep pointing out how ridiculous it is. 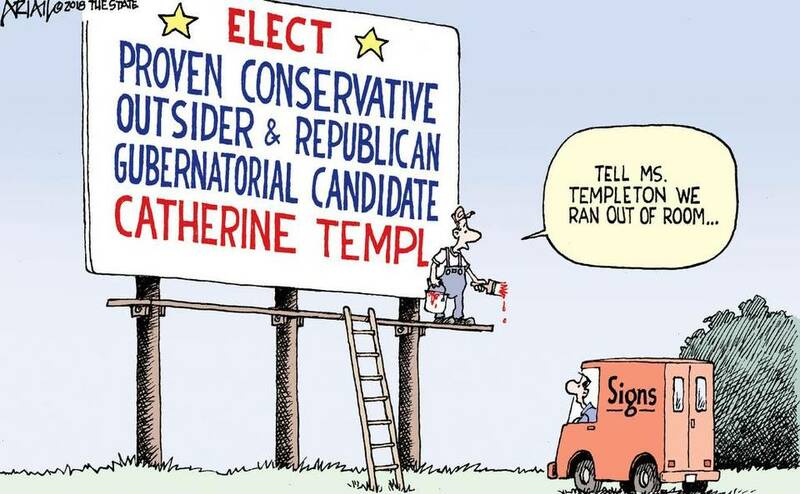 The more I see her campaign refer to her, over and over and over again, without deviation, without letup, as “Conservative outsider and Republican gubernatorial candidate Catherine Templeton,” the more I marvel at their apparently limitless tolerance for tedium. This entry was posted in 2018 Governor, Catherine Templeton, Republicans, South Carolina, Words on May 16, 2018 by Brad Warthen. Forgot to share this Henry McMaster ad a couple of weeks back. Remember when I said Henry’s accent needed to be preserved and placed in a museum? Well, he outdid himself in that one. I got to thinking about that ad because of his new one, in which he takes on a nastier edge and makes like Catherine Templeton voting for Vincent Sheheen for governor in 2010 was a bad thing. When in truth, it’s one of the few good things I’ve ever heard about her. Meanwhile, he suggests that being “friends” with Donald Trump is a good thing. It’s just a topsy-turvy world that Henry inhabits. But snark aside: That’s one very ugly ad. Listen to the irritating female voice that just drips with sarcasm when it says, “because Nikki’s Democratic opponent was her friend.” As though there could be nothing more contemptible on Earth than calling Vincent Sheheen your friend. Or any Democrat. As though they were some subhuman species. That’s a truly disgusting video, governor, and you should be ashamed of it. Are you going to keep going down this trail? 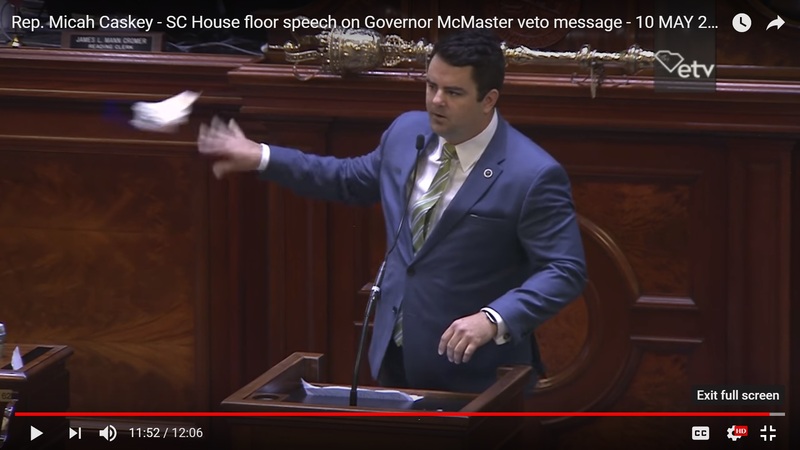 This entry was posted in 2018 Governor, Catherine Templeton, Henry McMaster, Republicans, South Carolina, Video, Vincent Sheheen on May 15, 2018 by Brad Warthen. She bragged about that .38 her granddaddy gave her for months on end, making herself out to be some latter-day Annie Oakley. Or someth‌ing. Then, she led a TV crew to a shooting range, pulled out the gun, and… couldn’t get it to fire. What do you want to bet whether she actually hit a rattler with that snub-nose? Or whether she was even within a mile of the varmint? These questions I’m asking don’t matter a bit, of course, except to the kind of voter she’s trying to reach. 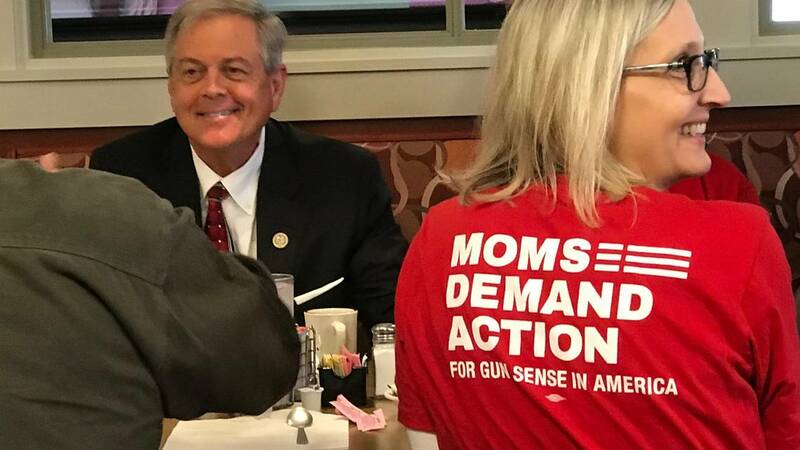 This entry was posted in 2018 Governor, Catherine Templeton, Guns, Out There, Republicans, South Carolina on May 9, 2018 by Brad Warthen. This is my front yard. As of Monday night, for the first time in my life, my yard features a campaign sign for a political candidate. In fact, it boasts two. Well, with these two signs, I’m stepping out of the ranks of idiots (which my career as a journalist forced me to be, at least in a sense), and joining the polites — the involved public citizens. 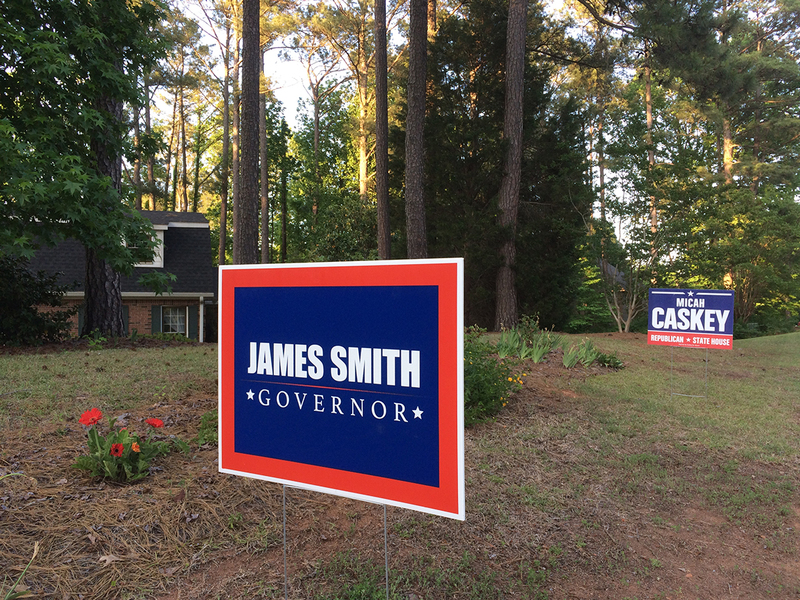 James Smith is the best candidate for governor by far, and Micah Caskey is easily the best candidate for his House seat, if not the best running for any House seat this year. They are the two people I most hope to see elected this year, for reasons I’ve gone into in the past and will elaborate upon again, I assure you. By erecting these two signs, I also take a stab at resolving a dilemma. A couple of weeks ago, Micah Caskey, standing on the State House steps, asked me to vote for him on June 12. Specifically, he nodded toward James Smith — whom he knows I like for governor — a few feet away and said he hoped I wouldn’t be voting in the Democratic primary, because he needs my vote in the Republican. The fact that I have to choose, and can only vote for one of the two people I want most to elect on primary day, is a gross injustice. But it’s one I have to confront. Normally, I take a Republican ballot. Not because I’m a Republican, any more than a Democrat, but simply because of where I live. If I don’t vote in the Republican primary, I get no say in who represents me in most offices. If I lived in Richland County, I’d probably vote mostly in Democratic primaries — especially this year, with that solicitor’s race. We have to choose carefully: Our primary vote is critical because far too often, it’s the only time we get a real choice. That we have to choose one ballot and miss having a say in the other races that are contested in the primary (but not in the fall) is wrong, a denial of our rights as citizens. It thoroughly disenfranchises us. But those who make the rules refuse to see that. This entry was posted in 2018 Governor, Cindi Scoppe, Citizenship, Civic virtue, Democrats, Elections, James Smith, Micah Caskey, Republicans, South Carolina on May 8, 2018 by Brad Warthen. This entry was posted in Civic virtue, Civility, Democrats, Leadership, Republicans, Social media, South Carolina, UnParty on April 30, 2018 by Brad Warthen. I think I forgot to share this last week when it ran, which is a violation of the blog by-laws or something: When someone alludes to “Cool Hand Luke,” there must be an acknowledgment. This entry was posted in Henry McMaster, Movies, Republicans on April 30, 2018 by Brad Warthen. Yesterday afternoon I ran into my representative, Micah Caskey, on my afternoon walk, and asked what he’d been up to on such a fine Wednesday. He was glad to tell me, as he’d had a good day doing worthwhile work for us all. He told me briefly about it, and followed up with more info today. You know about Henry McMaster’s stupid Sanctuary Cities bill, the pointless solution to a non-existent problem. We have no Sanctuary Cities in South Carolina, a fact that no one disputes — but in order to pander to the Trump crowd, the governor would force South Carolina municipalities to file a bunch of red tape proving they’re not sanctuary cities, or lose state funding upon which they rely. Micah did a nice job selling his amendment, bringing along this Powerpoint presentation to explain the actual facts of the situation, and what he proposed to do. So basically, he managed to strip out the stupidest part of a stupid bill, minimizing the damage of what he termed the Incremental Growth of South Carolina Government Act. This entry was posted in Immigration, Law enforcement, Leadership, Legislature, Micah Caskey, Republicans, South Carolina on April 19, 2018 by Brad Warthen.